It’s a brisk, early morning in September of 1997. I’m sitting at a picnic table at an elementary school playground, just north of Pittsburgh. My nine-year old self is huddled up with a few friends, rummaging through the new cards we had acquired over the summer. We were all in awe over Jeffy’s Joe Thornton rookie card, when a boy with a Sidney Crosby-esque pencil mustache approached us. 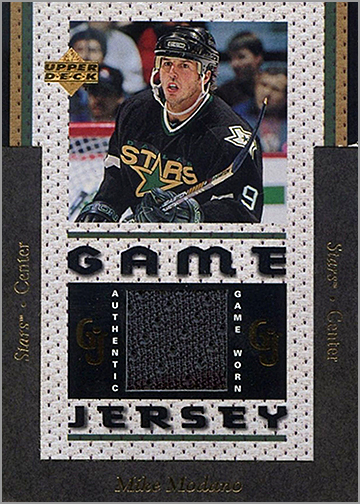 He laid something out on the table that blew our pre-pubescent minds: a Mike Modano 1996-97 Upper Deck Game Jersey card. We stared in amazement, like it was a winning lottery ticket. Joey glared at us like we were mere peasants in his newfound collectors kingdom. He then slowly picked up the card and walked away, without another word, leaving us in utter disbelief. 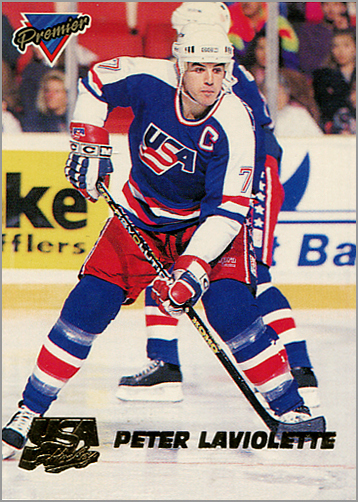 After the modest, fourth-place finish of the 1992 U.S. Olympic Hockey team, and an increasing nostalgia for the 1980 “Miracle on Ice,” Topps issued cards of players from the 1994 U.S. National Team. Most of these players went on to play for Team USA at the 1994 Winter Olympics in Lillehammer, Norway, and quite a few went on to have successful careers in the NHL afterward. 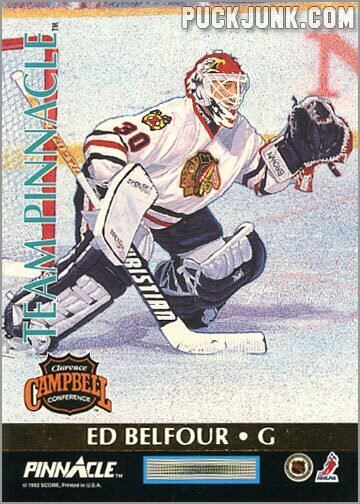 Team USA insert cards were found one in every 12 packs of 1993-94 Premier Series Two. If I remember correctly, Series Two came out around February of 1994, the same month the Olympics were taking place, so the timing was right. The set consists of 23 cards. Some of the more notable players in the set are Brian Rolston, Brad Marchant and Peter Laviolette. 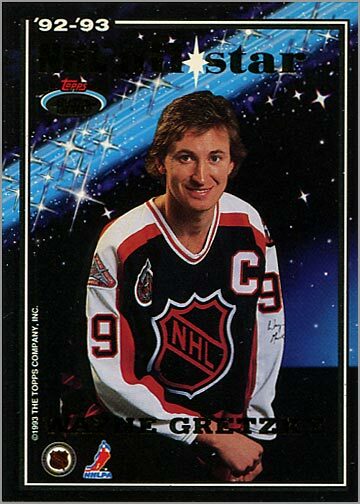 From 1985-86 to 1990-91, both Topps and O-Pee-Chee printed special trading cards on the bottom of the boxes of hockey cards. If you think about it, these “box bottoms,” as they are usually called, are like the short prints of the vintage era because you only got four per box. You either had to buy the entire box of cards to get just four box bottoms, or find other ways to acquire them. 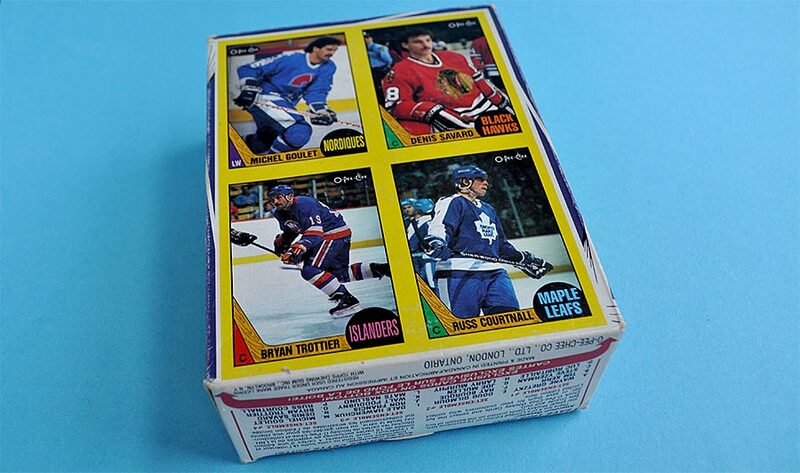 The 1987-88 O-Pee-Chee Hockey Box Bottoms set features cards of players who led their playoff-bound teams in scoring during the regular season; that is, they were on a team that made the playoffs and led their team in scoring during the regular season. This just might be the high-water mark of hockey box bottom sets, as 12 of the 16 players here were later inducted into the Hockey Hall of Fame. 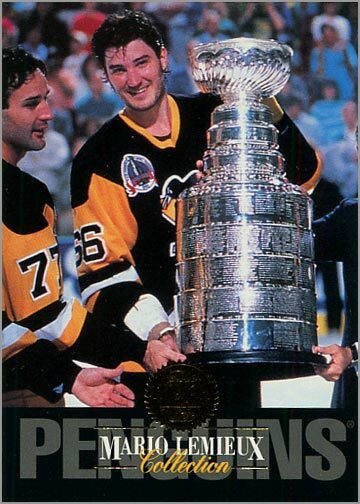 The 44th NHL All-Star Game, held at Montreal Forum on February 6 of 1993, was the end of an era for the league’s annual best-vs-best game. This was the last time the Wales Conference and Campbell Conference would square off; next season, they were renamed the Eastern Conference and Western Conferences, respectively. It was also the last time the All-Star Game uniforms would feature the familiar black, white and orange palette that had been the game’s color scheme since 1973. What if Topps didn’t always play it safe? In that decade, Topps hockey sets were not much bigger than most non-sports sets, sometimes weighing in at a scant 165 cards. 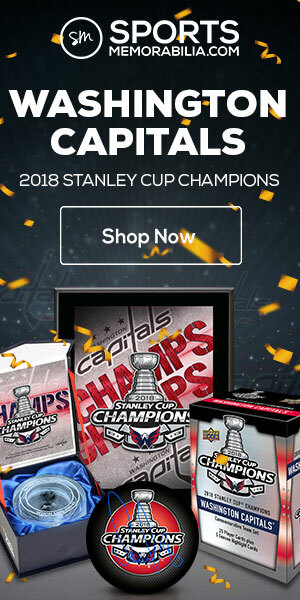 That is, if they even bothered to make a hockey set at all. 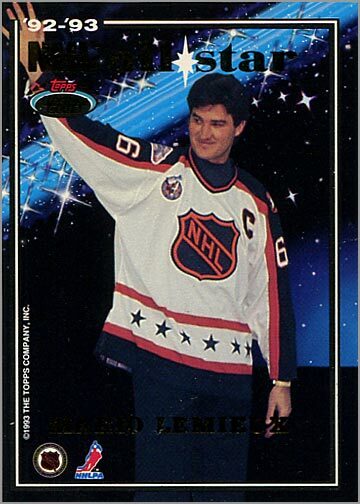 Those of us who started collecting hockey in the 1980s will remember when NHL players had to EARN a rookie card. 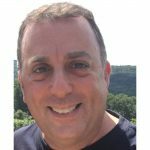 While some exceptional players in the 1960s and 1970s got rookie cards during their rookie season–like Bobby Orr and Guy Lafleur–the 1980s were a different story. A player had to play a full season before they were granted cardboard. 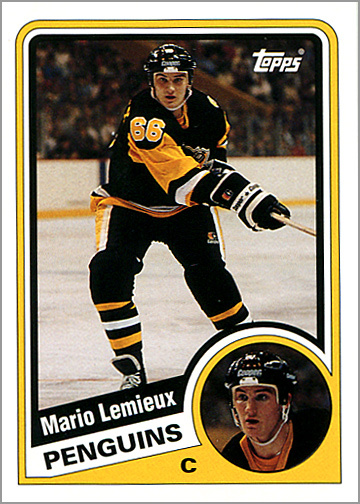 Even Mario Lemieux, who rewrote the record books in junior hockey and was drafted first overall, had to play in the NHL for a year before getting a card. 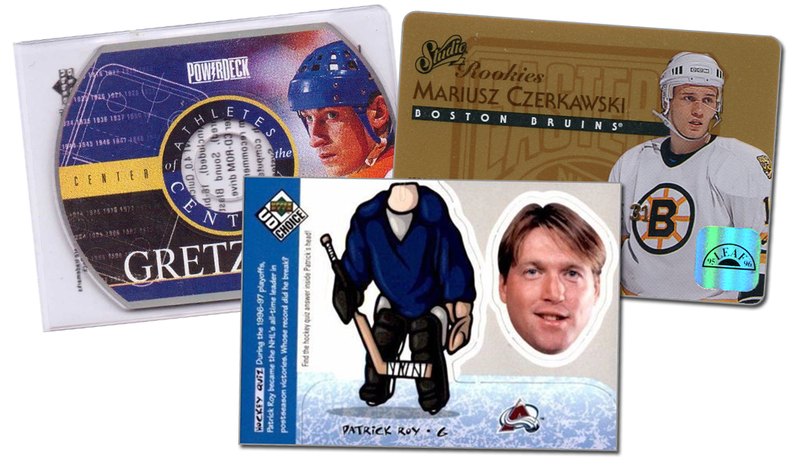 In 2003-04, Topps released an insert set called The Lost Rookies. 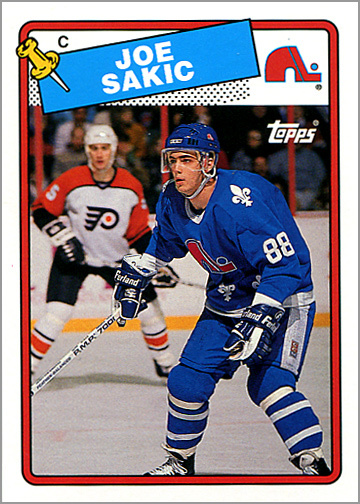 Found 1 in every 12 packs of Topps Hockey, The Lost Rookies is a “what if” set that depicts 11 superstars on cards from their rookie year–such as Lemieux on a 1984-85 Topps card or Joe Sakic in the 1988-89 set. 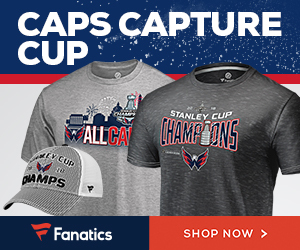 It is a very cool idea, and a great set for anyone who enjoyed hockey in the 1980s, 1990s or 2000s. Remember when a print run of 10,000 copies felt small? That number is laughable now, as numerous insert sets today are limited to 99, 50 or even just 10 copies of each card.Of course, there are 1 of 1 cards to collect too, so tracking down a set limited to “just” 10,000 copies doesn’t seem too daunting. 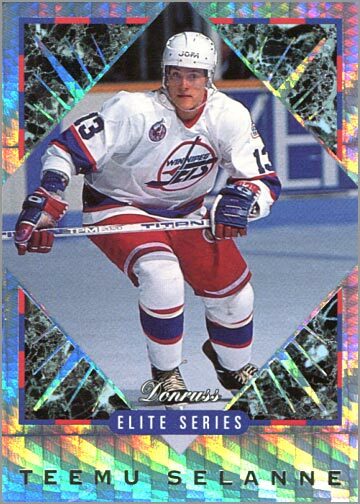 But back during the 1993-94 season, it was a good idea at the time, given the millions of cards printed during the hockey card boom. The 1993-94 Donruss Elite Series insert set was a sign of things to come, a harbinger of serial numbers and shiny holo-foil. Given that insert sets became more and more numerous, stepping back and making something that was limited in print run and looked extremely different than the base set design made this insert set unique. 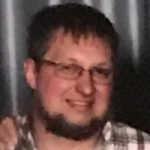 One of the coolest things that makes hockey so different is the uniqueness of the goaltender. 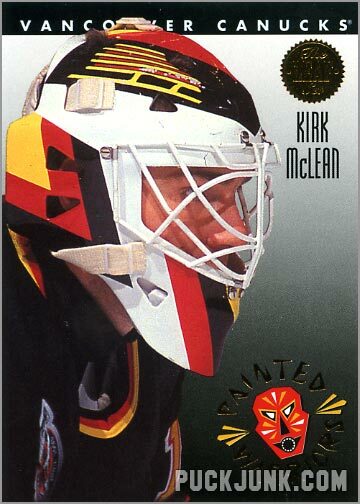 Not only do hockey goalies wear padding all over their body to stop flying pucks, but they can have their mask painted any way they want – a tradition that started with Gerry Cheevers in the 1970s and continues to this day. You would never see a football quarterback paint his helmet differently than his teammates, or a baseball power hitter emblazon his batting helmet with his nickname. But in hockey, this is perfectly normal – hell it’s almost expected. 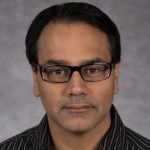 From Cheever’s “stitches” to John Vanbiesbrouck’s “Panther”, custom goalie masks are as much a part of the game of hockey as an open ice hit, the slap shot or the Zamboni itself.